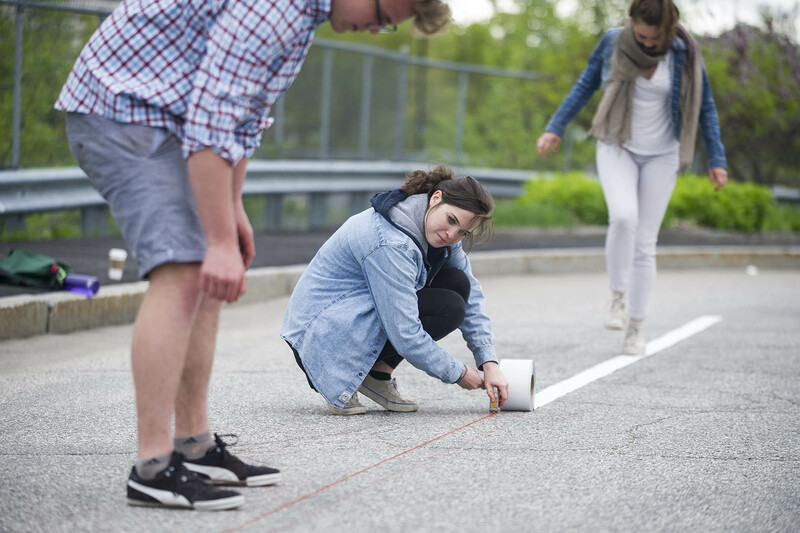 In response to her classmate, Anna Marr ’17 knelt down on a Lewiston street and pinched a red-chalk-coated string that two classmates held taut and low. She pulled the string up — and let it snap back onto the asphalt. Marr, of Larchmont, N.Y., was snapping a chalk line — that is, executing the classic builders’ technique for making a straight, true mark on a long flat surface. 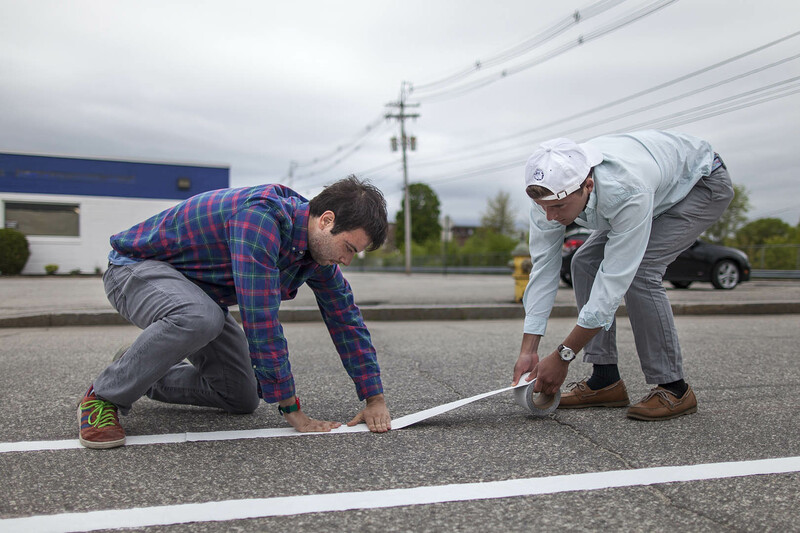 The students used the powdery red line as a guide for strips of white reflective tape that, after careful measurement, they were laying to mark off a bike lane on Oxford Street, a canal-side byway in Little Canada. It was the gray chilly morning of May 20, and the four Bates students had taped maybe 50 feet of bike lane, with 750 feet to go. Teaching the course is Mike Lydon ’04, an internationally recognized urban planner, advocate for livable cities and co-author of the book Tactical Urbanism: Short-term Action for Long-term Change. Lydon is one of a new breed of Bates teachers: so-called practitioners-in-residence, who are successful young adults — most of them Bates alumni — in occupations ranging from social justice advocacy to music production. As part of Bates’ Purposeful Work initiative, Lydon’s 16 students and those in the other practitioner-taught courses during this Short Term are benefiting from the applied knowledge and skills — snapping chalk lines, you bet, but much more — that the practitioners have accrued during their careers. 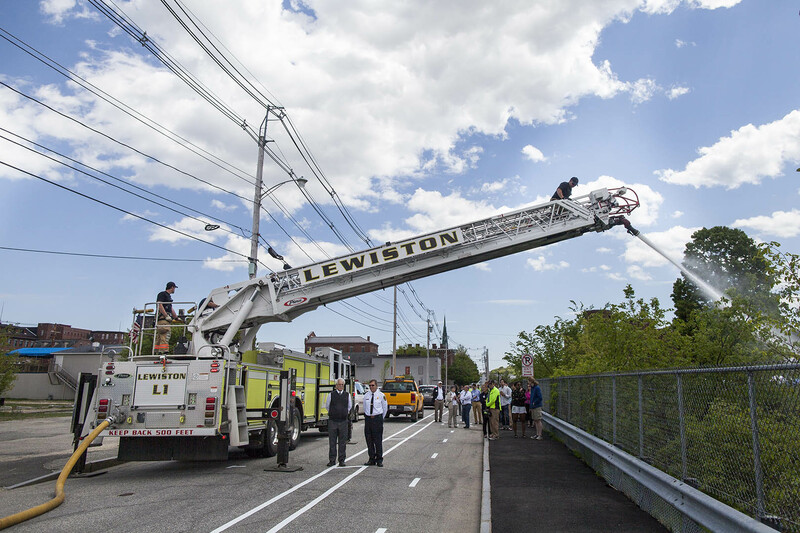 During a break in the lane-taping, Lydon explained that the course is conveying students from a survey of the field of urban planning to a specific problem in a real city: The temporary bike lane that the students would present during a public festivity on May 21 was a component in the exploration of creating a walker-bicyclist trail connecting Lewiston’s Main Street with a park in Auburn. 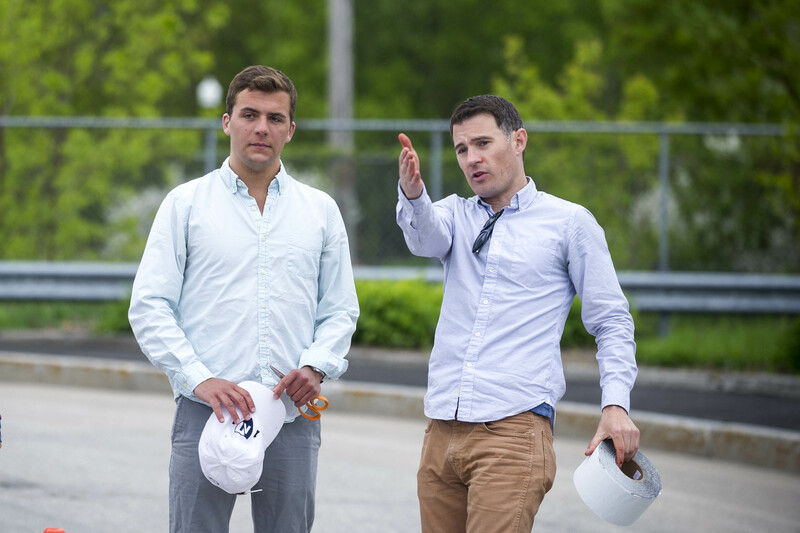 The trail is an outcome in a project that Lydon’s firm, Street Plans Collaborative in Brooklyn, has undertaken with the Androscoggin Transportation Resource Center, a program of the Androscoggin Valley Council of Governments. The bike path reflects Street Plans’ gradual, iterative approach to getting buy-in on new approaches to public facilities. “To propose change all at once, with permanent infrastructure, is hard for people. And politically it becomes a big challenge,” Lydon said. 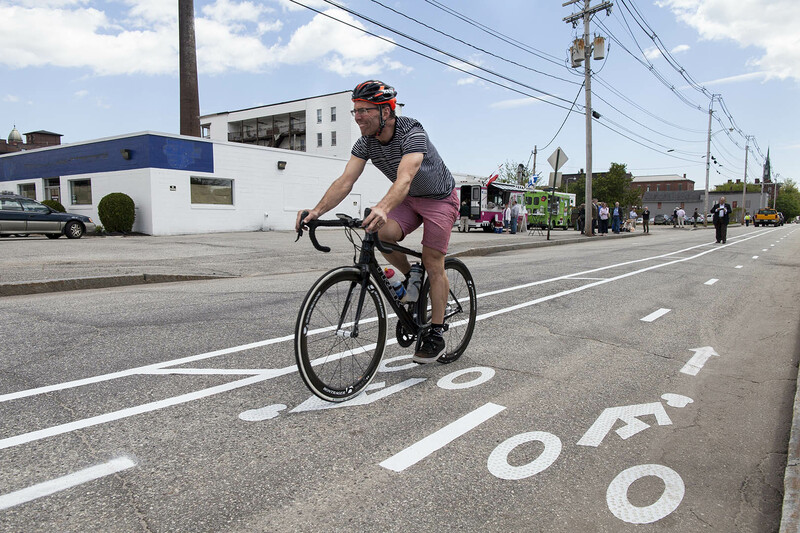 Street Plans will base its recommendations for the next phase of the park connector, in part, on how visitors respond to a demonstration of the bike lane and other activities on May 21 — overall, a project organized by Lydon’s students. In addition to creating the bike lane and the street fair, the students collected, and will help evaluate, public feedback from the day. On that chilly May morning, more classmates were busy farther south on Oxford, at the entrance to Simard-Payne Memorial Park, where French Canadian immigrants once arrived by train over tracks still visible in the grass. These students had already set up a big chalkboard by the park entrance. Now they were weaving letters in orange tape into the park’s chain-link enclosure: “Oxford Forward,” the name of the May 21 event. For Munoz, urban planning was a welcome discovery. “I love how interdisciplinary it is,” she said. “It takes into account so many different fields — not just art and design, but also social issues, economics, biology. As liberal arts majors, I think that’s really appealing to the majority of Bates students. May 21 was a sunnier day. Municipal officials, developers, urban planners and other participants in the Build Maine conference, taking place in a nearby mill building (Lydon was a conference presenter), were happy to sit in Simard-Payne, listen to the jazzy funk of a band from Augusta, and eat barbecue and poutine from the food trucks. A few hundred feet away, four Bates students struck yoga poses in the grass. A few visitors followed the old Lewiston & Auburn Railroad rails to the footbridge that links Simard-Payne with Auburn’s popular Rodney Bonney Memorial Park. Every so often a cyclist would zoom through the bike lane, looking a bit out of place on this normally sleepy street used mainly by rush-hour commuters cutting around the busy intersection at Lincoln and Cedar streets. Eventually, city vehicles arrived to test clearances on the driving lane, which was considerably narrowed by the bike lane and some cars parked beside it as a test. The two fire trucks, including one equipped with a water cannon, got through OK and proceeded to send a celebratory stream of water into the canal. But the city snowplow couldn’t squeeze through. Perhaps not a problem, as snow and bikes don’t happen simultaneously that much. But still.